Most of us cooks have a go-to pancake recipe, that we pull out for those, “I must have a pancake” days. I’ve had a recipe now for about 5 years that always hits the spot, and serves up that warm, “I love you feeling”, that us mom’s love to dish out to our families. However today, I couldn’t find that recipe, and being in a bit of a hurry, I decided that I’d try a recipe I’ve been holding onto now, for about 4 years. Lemon pancakes. Now you might be thinking, lemon pancakes?? hmm, no thanks. Well, I was feeling adventurous and so I went ahead and made them. Well, was I glad I did! 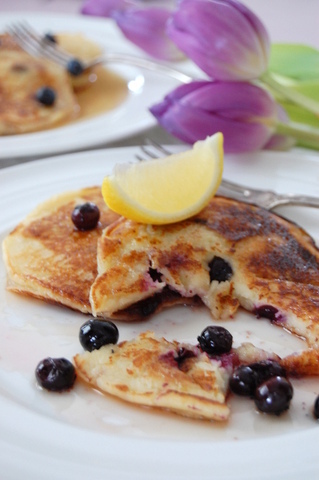 These lemon pancakes are delicious! They’re luscious and sweet, not tart, and they’re soft and velvety inside, but crispy around the edges, which is exactly, how I like them. They’re an absolutely perfect combination when paired with beautiful, real maple syrup. Honestly, you have got to try these, to see just how delicious and full of flavour they are. Served on their own, or as part of a brunch, they will elevate the pancake to a dish that tastes delectable, without a lot of cream, toppings or fruit. All you need is a lovely lemon to serve up these warm, delicious discs of goodness! 1. Beat the sour cream, butter and egg in a bowl. Slowly stir in the lemon juice and zest. In another bowl, combine flour, baking powder, salt and sugar. Add dry ingredients to the sour cream/egg mixture. Mix until well combined. 2. Add the milk and stir until combined. 3. Pour about a tablespoon of oil into a heavy skillet and let it get hot. Pour about 1/2 cup of batter into the pan and spread it out into a round disc. Push 5 or 6 blueberries into each disc and cook until golden brown, then flip. 4. Serve with real maple syrup and more blueberries. Pouring the batter into a hot oil will give you a beautiful golden crisp edge around the outside of your pancake, which is just gorgeous, to push your fork into and serves up a delicious, crunchy texture on the outside, followed by a soft luscious center. If you prefer a pancake that’s soft on the outside, use a griddle that’s set to a slightly lower heat, and lightly greased. Cook, turning once, until golden brown. This recipe is quite small, making only 9-10 medium-sized pancakes, which is great for 2 or 3 people, but you’ll definitely want to double or triple it for a crowd. I love pancakes. I love blueberries. I love lemon. I love maple syrup. It just doesn’t get any better than this. Enjoy!